On a day when temperatures were supposed to hit the mid 90s in northern New Hampshire and 100 from Concord south, with high humidity to boot, a brook and waterfall hike was the way to go. 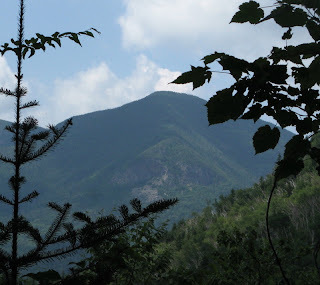 One of the "cool" hikes I like best is in to the Waterville Flume, a much smaller and far more secluded gorge than the famous one in Franconia Notch. 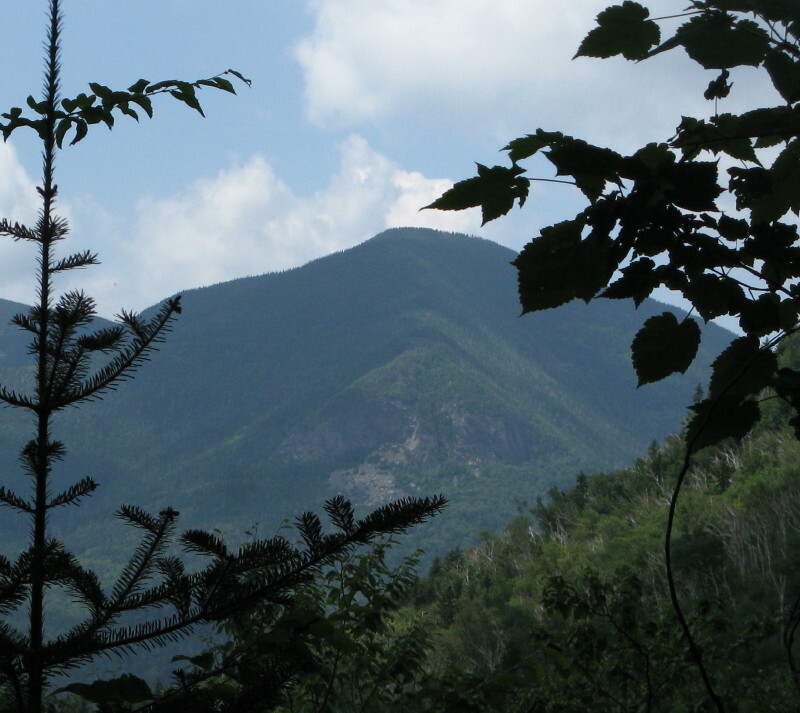 Adding to the attraction was the chance to visit two long-forgotten cascades that appeared on turn-of-the-20th century maps of Waterville Valley. After a short jaunt on the Livermore Trail from the Depot Camp parking area, this hike heads up the gentle Mad River valley on the Greeley Ponds Trail. Less than a mile in the hike I splashed my head and neck with cold water for the first of many times this day, at the bank of the Mad River. The trail crosses the river on the rebuilt Knight's Bridge. At 1.5 miles from the trailhead, I turned R on the Flume Trail (aka Flume Brook Trail), one of several interesting trails maintained in this area by the Waterville Valley Athletic and Improvement Association (WVAIA). There was a logging camp nearby here into the 1930s, and a small dam was once built on Flume Brook to store water for spring log drives downstream on the Mad River. A bit of poking around revealed a few artifacts in the woods, such as this old bucket. Another short off-trail excursion brought me to what I believe is Towle's Falls, shown on the 1982 and 1904 maps of Waterville Valley by A.L. Goodrich (father of the well-known trailman and Waterville historian, Nathaniel Goodrich). According to A.L. Goodrich's accompanying guidebook The Waterville Valley (the 1892 edition of which can be viewed on Google Books), they were named for the Hon. Geo. M. Towle of Brookline, MA. Back on the trail, I passed some good rockwork by the WVAIA trail crew. The inviting path led ever farther up this quiet valley. At times the trail edged along the small but attractive brook. Soon after passing the junction with the Old Skidder Trail, I reached the Waterville Flume and secured a rock seat at the edge of a pool below a sliding cascade. The temperature here was a good 10 to 15 degrees cooler than in the surrounding woods. The fractured north wall of the Flume rose high above. A rough path led up through the Flume to a mossy cascade above and around the corner. After admiring the Flume, I retraced steps to the Old Skidder Trail and followed this interesting route, opened around 10 years ago, as it climbed the slope above the south side of the gorge. Partway up this rock slab looms up on the R.
This part of the trail is on a narrow sidehill, tricky snowshoeing if crusty. After a while it levels off on an obvious old logging road. Then it turns off the road and meanders up through a lush high country forest, elevation 2800 ft. The Old Skidder Trail ends on the Livermore Trail well above the junctions with the Tripyramid trails. I decided to extend my walk N for 0.4 mile along Livermore Trail to the clearing at the site of the old Flume Brook logging camp. This section of trail provides easy walking across a high, remote plateau S of Livermore Pass. Probably more mountain bikers than hikers come through here. This mini-cascade is on a branch of Flume Brook crossed by the trail. On the opposite side of the trail are the remains of an old wooden bridge abutment. The Flume Brook Camp clearing is an interesting spot in the middle of nowhere. From here the Livermore Trail continues, wet and obscure, through Livermore Pass before dropping to the Kancamagus Highway. Here also the Kancamagus Brook Ski Trail (too swampy for hiking) departs for a long descent to the Greeley Ponds Trail just N of the Flume Trail junction. On my return trip I bushwhacked the steep, densely grown slope along Flume Brook, well above the Flume, in search of the "Green Cascade" shown on the old Goodrich maps. I knew this would be a somewhat difficult search from one who had been there. First I saw this little spot - green, yes, but pretty small to have a name. ...and there was, I assume, the Green Cascade. I chilled out here for quite a while, marveling at the many mossy tiers. The vivid greenness reminded me of the larger Hawthorne Falls on the NE flank of Mt. Garfield. After a dense whack back to the trail, I caught this peek at East Osceola from the descending section of the Old Skidder Trail. ...and a side view from above. A nice way to cap off a watery hot day in Waterville.